Two shells sizes with all the good full faces helmets characteristics but made for easy rides. An overall of 7 sizes, from XS sizes to triple XL ( XXXL), every head can fit this helmet. 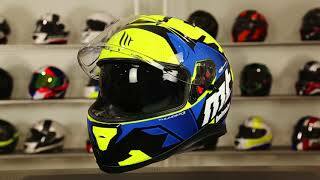 Can be used like Snowmobile helmet with snow breathguard, snowmobile neck curtain and “double or electric lens”. Special comfort fabrics. One of the safest helmets in the market, with a high score of 4 stars in the prestigious SHARP test.